^ ا ب پ ت ٹ ث ج چ ح Rajapaksa S, Starr M (May 2010). "Croup – assessment and management". Aust Fam Physician 39 (5): 280–2. PMID 20485713. ^ ا ب پ ت ٹ ث ج چ ح خ د ڈ ذ ر​ Cherry JD (2008). "Clinical practice. Croup". N. Engl. J. Med. 358 (4): 384–91. doi:10.1056/NEJMcp072022. PMID 18216359. ^ ا ب پ ت ٹ ث ج چ ح خ د ڈ ذ ر​ Everard ML (February 2009). "Acute bronchiolitis and croup". Pediatr. Clin. North Am. 56 (1): 119–33, x–xi. doi:10.1016/j.pcl.2008.10.007. PMID 19135584. ^ ا ب پ ت ٹ ث ج چ ح خ د ڈ Johnson D (2009). "Croup". Clin Evid (Online) 2009. PMID 19445760. ^ ا ب پ Klassen TP (December 1999). "Croup. A current perspective". Pediatr. Clin. North Am. 46 (6): 1167–78. doi:10.1016/S0031-3955(05)70180-2. PMID 10629679. ^ ا ب Russell KF, Liang Y, O'Gorman K, Johnson DW, Klassen TP (2011). "Glucocorticoids for croup". Cochrane Database Syst Rev 1 (1): CD001955. doi:10.1002/14651858.CD001955.pub3. PMID 21249651. ^ ا ب Marchessault V (November 2001). "Historical review of croup". Can J Infect Dis 12 (6): 337–9. PMID 18159359. ↑ Vorwerk C, Coats T (2010). 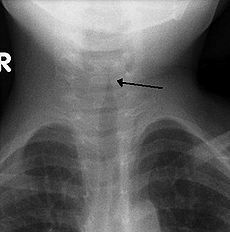 "Heliox for croup in children". Cochrane Database Syst Rev 2 (2): CD006822. doi:10.1002/14651858.CD006822.pub2. PMID 20166089.